Prayer for the dead is mentioned as early as the last pre-Christian century (see II Macc. xii. 44), and a sacrifice for the dead, probably given in the form of charity, was known in Talmudic time (Sifre, Deut. 210; Hor. 6a). The reading of the chapter "Aḥare Mot" on the Day of Atonement suggested the idea of offering on that day a special prayer for the memory of the dead (comp. Pesiḳ. 174b with the interpolated sentence in Tan., Yelammedenu, Ha'azinu, and Kol Bo, lxx.). Regarding the extension of the prayer for the dead to other holy days, see the literature in Bet Yosef, Ṭur Oraḥ Ḥayyim, 621; M. Brück, "Pharisäische Volkssitten und Ritualien"; L. Löw, "Gesammelte Schriften," i. 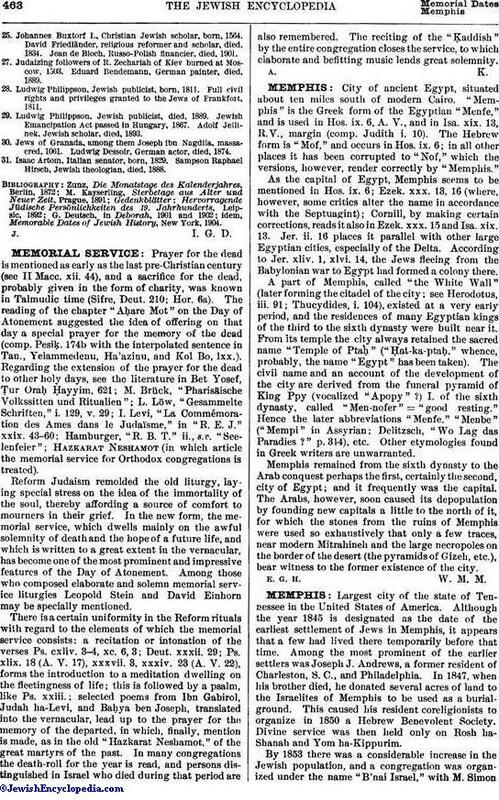 129, v. 29; I. Levi, "La Commémoration des Ames dans le Judaïsme," in "R. E. J." xxix. 43-60; Hamburger, "R. B. T." ii., s.v. "Seelenfeier"; Hazkarat Neshamot (in which article the memorial service for Orthodox congregations is treated). Reform Judaism remolded the old liturgy, laying special stress on the idea of the immortality of the soul, thereby affording a source of comfort to mourners in their grief. In the new form, the memorial service, which dwells mainly on the awful solemnity of death and the hope of a future life, and which is written to a great extent in the vernacular, has become one of the most prominent and impressive features of the Day of Atonement. Among those who composed elaborate and solemn memorial service liturgies Leopold Stein and David Einhorn may be specially mentioned. There is a certain uniformity in the Reform rituals with regard to the elements of which the memorial service consists: a recitation or intonation of the verses Ps. cxliv. 3-4, xc. 6, 3; Deut. xxxii. 29; Ps. xlix. 18 (A. V. 17), xxxvii. 3, xxxiv. 23 (A. V. 22), forms the introduction to a meditation dwelling on the fleetingness of life; this is followed by a psalm, like Ps. xxiii. ; selected poems from Ibn Gabirol, Judah ha-Levi, and Baḥya ben Joseph, translated into the vernacular, lead up to the prayer for the memory of the departed, in which, finally, mention is made, as in the old "Hazkarat Neshamot," of the great martyrs of the past. In many congregations the death-roll for the year is read, and persons distinguished in Israel who died during that period are also remembered. The reciting of the "Ḳaddish" by the entire congregation closes the service, to which elaborate and befitting music lends great solemnity.